Easter is just around the corner, so all the necessary preparations for this Holy, and very traditional holiday, have to be planned well in advance, to be fully achieved in a timely fashion. 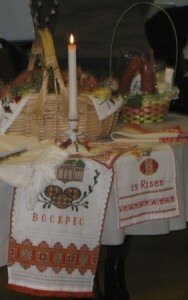 Ukrainians, and many other nationalities, enjoy many very rich traditions associated with Easter celebrations. 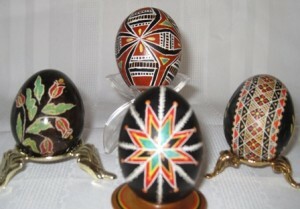 You can click on the links below, to learn more about the Ukrainian Easter Traditions. This weekend was Paska Baking time for me and my daughter, as well as my 4 year old granddaughter, who not only loves to watch, she also was a very enthusiastic helper. We are so blessed to have her in our family. As a result of about 10 hours of Paska Baking time, we ended up with 9 round Paska loaves, as pictured above ( the small “roll” like loaf, was a left over dough from our decorations, so we decided to bake it for the youngest member of our family, who is only 10 months old). We doubled our original recipe (in the link above), and implemented some changes to the second batch of dough, just to test the theory passed on to us by our friends. In the second batch, we replaced 2 cups of regular flour, with 2 cups of CAKE flour, and used only 1/4 cup of melted butter plus 1/4 cup of Canola oil. We also kneaded the dough for about 30 minutes in the bowl, and skipped the kneading on the floured board. My oven seems to be baking better at lower temperatures, so I bake my paska for 15 minutes at 350 degrees F, and another 30 minutes at 325 degrees F, rather than the 15 @400, and 30 @350. Here is a cross-cut section of our paska bread. As you can see it turned out very light, and fluffy. The paska with the cake flour was fluffier than the regular recipe, and the one with the mixture of butter and oil crumbled less, than the one with butter only. Per baking tips from my mom, I always brush the tops of my baked, still slightly warm paska, with melted butter, to give them a nice finish, and to soften the crust. Since I bake my paska at least a week before Easter, so to keep it nice a fresh, I freeze it until Easter Saturday. Once the bread is totally cooled off, I wrap it in aluminum foil, place it in a freezer bag, and freeze it. I also store it in a zip-lock bag after blessing of the basket, to keep it from drying out by Easter Sunday. In my previous post about the different bakeware for baking paska, I promised that if I find more information about my favorite pans, will share it with you. I stopped at a local Goodwill store, and to my surprise, I found several similar (brand new) pans, and bought them all @ one dollar each. 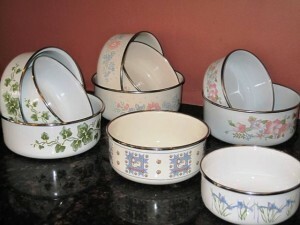 Most of them still do not have any manufacturing information on them, however one set was made by KOBE mixing bowls, designed exclusively for JC Penny, made in Indonesia. 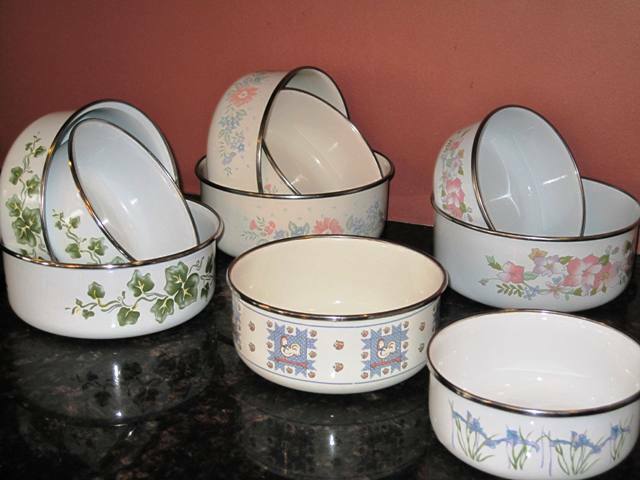 Also, some of the flower designs of these bowls, resemble Corningware dinnerware, wouldn’t you agree? If you still need to bake your Paska, now you have additional tips on the original recipe, and the paska bakeware. Enjoy your Paska Baking experience. Please share your pictures and tips. 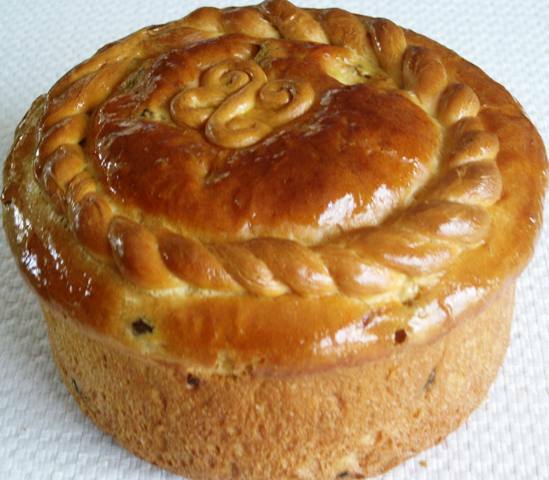 Hi, I am going to bake Paska this weekend for my first time. Mama always did the baking and I was the one to help here. Mama kept everything in her head she didn’t write anything down. I learned from watching Mama, and than she watched me do it. Thank you for putting everything down so people like me can follow along. Again thank you, and God Bless. KHRYSTOS VOSKRES. Here in the Western part of Denmark I am just making Paska for my daughter in law, who came from Kiev 2 ½ years ago. I have just put my bread in the oven, and they look very good. I am trying to make her an easter basket, not quite original, but with the things I can get here. I look forward to surprise her tonight ! You are amazing! Sounds like you care deeply about your son and his choice of a wife, your daughter-in-law. 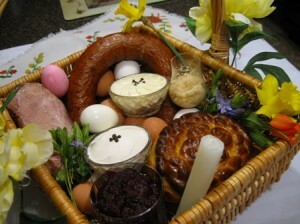 I am sure they both will really appreciate the beautiful surprise of a Ukrainian Easter Basket. I would love to ask you to share a picture, and permission to post it on my website. 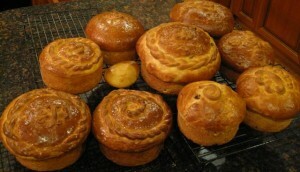 Wow- I just made my paskas after a call to my Mom – couldn’t remember what to put the breaddough in. She said cakepans, but I rememberd my Grammy’s bread being soooo tall! So cake pans it was and then I sat at the computer and magically found your website (which is now one of my favorite favorites!) No, my bread didn’t come out high but now I know my Grammy’s secret. PLus, I have another hint: clean never used dog bowls – they are heavy stainless steel and the perfect height (we have a tall greyhound!) So I printed out your bakeware to add to my Russian cookbook for next year. Next year I will have the tall paska like my grandmother! THANKS SO MUCH!!! KRISTUS ER OPSTANDEN! – JA HAN ER SANDELIG OPSTANDEN! Oh, that is wonderful. I would love to have a picture of your basket, but will have to post it for next year’s Easter, to keep it time appropriate. I will update this year’s post with the Danish Easter Greeting. Curious, which recipe does your family like best ? 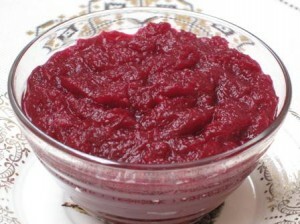 The recipe in this post is the one I always used and is my family’s favorite. 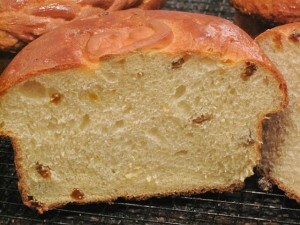 The bread is gently sweet, so it goes very well with the kobasa and ham for Easter Breakfast.